Jaw scales are disposable paper measuring scales for patients and providers to measure the opening, movement and function of the mouth and jaw. Jaw opening is measured as range-of-motion (ROM) or maximum-interincisal-opeining (MIO) with the adult average oral opening approximately 50mm ROM or MIO. With simple use and accurate tracking, patients are motivated and clinicians feel more assured in progress. By quantifying the treatment method and results with concrete measurements, better diagnosis and treatment is possible. 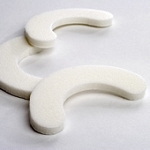 The OraStretch® ROM scales were specifically designed for patients with severely limited openings. The tapered ruler design allows for measurement of the smallest openings, down to 3mm. 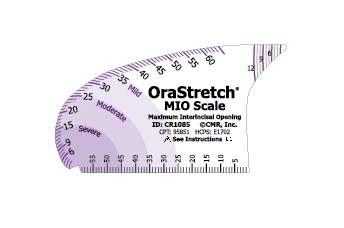 The OraStretch® MIO Scales provide improved visibility, and a vertical, lateral and protrusion scale. They also include a small scale for improved measurement of very restricted openings. 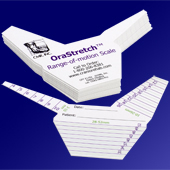 Both OraStretch scale types include a lateral movement scale and a pro/retrusion scale. These allow the provider to better gauge the total 360-degree movement of the patients jaw.